It is always difficult to review a release that has been declared “Album of the Year” by others; your expectations are heightened with a sense of anticipation and half an ear is on the plaudits you may have already read. Still, the purpose is to review and inform and when all is said and done, it’s just words. 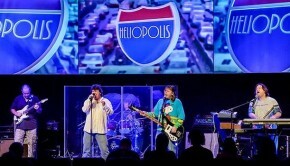 Heliopolis are a band I am aware of but have not previously heard and with members from acclaimed progressive rock bands Gabble Ratchet, Mars Hollow and Ten Jinn there is plenty of expectation. 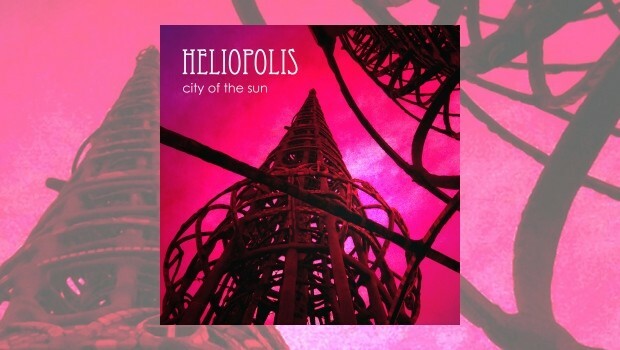 City of the Sun is the first album under this name, taken from the Greek ‘Helios’ (the Sun) and ‘Polis’ (city), a fairly appropriate name for a band from L.A. The heavy introduction of New Frontier reveals the metal prog pathway ahead. Edgy but involving with an almost grungy sound that then develops into something else. The pedigree of the band is the source of the inspiration and I’m sure that there are other influences here but some successful bands are drawn upon, Muse drifting into Rush with a few ELP/Yes keyboard flourishes. The lyrical structure is very Rush. A good opening track, the harmonies are as expected with a strong vocal performance from Scott Jones and I suppose I should have anticipated the solos. Take a Moment is very different, a nice bassline and drums with a power ballad-type lyric. There are a few keyboard displays – Matt Brown channelling his inner Keith Emerson – but the title is representative of the laid back content and this is essentially a power ballad with extra noodles. At times the keys are cheesy 70’s, then 80’s – hey, I’ve been around a while! – but it’s rare to find anything new under the sun and the music holds its own. Mr. Wishbone is quirky and I like it. A little discordant but definitely not formulaic, it is amusingly insane but could infuriate those with a love of a clear song structure. An instrumental piece with a few animal sounds, is Mr. Wishbone the dog? Another of what we used to call a power ballad – is the term still used? – I like the philosophical nature of the lyrics to Elegy which features more of those harmonies. The spirit of Keith Emerson appears again with little touches of jazz and strong drumming from Jerry Beller holding the track together. Kerry Chicoine’s bass counterbalances the drums nicely and this is a well-crafted album, both in terms of musicianship and production. After a piano introduction and acoustic segue, Love & Inspiration builds as more electric instruments join. Lots of little solo touches and key changes with a distinct mathematical progression make for a coherent piece with hints of Selling England by the Pound. This is prog but not entirely by numbers, the guitar of Mike Matier supporting Scott’s vocal before letting loose a nice solo. This has for me been a very enjoyable album, I wouldn’t go so far as to give it an ‘Album of the Year’ accolade but it is very good. A nice one for the car, okay for the lounge but probably not enough to avoid the almost inevitable “can you put something else on Dad”, although I hope that the subliminal bass will show the possibilities for my bass playing son. So in conclusion, it’s not a seminal album but it is a damned fine listening experience. Although I would have liked to hear a little more of the harder elements of New Frontier throughout the album I have not been disappointed, but nor have I had the ‘Wow!’ factor. From their press release Heliopolis state that their mission is “to build upon the foundations established by our previous musical experiences in a bold attempt to take the music further afield into uncharted sonic waters – with an emphasis on melody, composition and improvisation – and to bring the music alive onstage with energy and passion.” They have achieved this, but I think there is still a lot more to come. Try before you buy, but it does sit nicely, if you don’t want all your musical eggs in one basket.